All living Hall of Fame members vote for the Hall of Fame Inductee candidates based on the nomination form and any personal experience/knowledge they may have had with the Inductee Candidate. Two thirds of the votes in support of a candidate are required for induction. 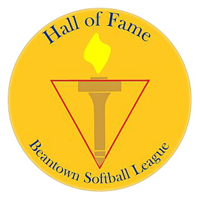 The Hall of Fame takes into consideration the nominee's record, abilities, integrity, sportsmanship, and character during the nomination process. It is important that these elements are properly exhibited and revealed in the nomination form. The nominee should fully participate in the completion of the nomination form and nomination process. The nominee is immediately mailed a letter by the Hall of Fame which acknowledges receipt of the nomination. Since the Hall of Fame consists of members whose B.S.L. careers have spanned different periods over the course of five different decades, it is imperative that the nominee's accomplishments and contributions to the B.S.L. be clearly expressed to members who do not know them. In an effort to give nominations the most thorough consideration possible, Hall of Fame members volunteer themselves as 'sponsors' of individual candidates. A sponsor acts as an advocate for a particular candidate during the consideration process. A sponsor is the 'go to person' should there be any questions or contact needed with the candidate. If a nominee prefers any particular Hall of Fame member to sponsor their candidacy, let the Hall of Fame know. The Hall of Fame suggests that the nominator interview the nominee to extract information and gain insight into the contributions of the candidate. This will provide a good nomination. It is strongly suggested that the nominator and nominee view this Hall of Fame Website to view the biographies of existing Hall of Fame members by clicking on Hall of Famers. You will understand what the Hall of Fame is seeking from a nomination. The nominee and nominator must provide their contact information so that the Committee can call upon them when questions arise during the review process. It is suggested that the "Hall of Fame Nomination Form" be used by both the nominator and the nominee. This form helps make it a bit easier to recall personal history during the nominee's BSL career. It is also the information that the Committee is seeking from the candidate. This form is available on this Hall of Fame website. Nominators and nominees are welcome to meet with the Hall of Fame or any of its members to discuss their nomination and any information related to it. 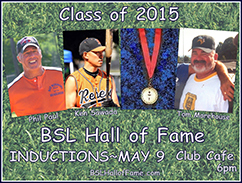 This can be done formally or informally through your sponsor or by emailing: info@bslhalloffame.com. The bottom line of the whole process is "the more information-the better"! And remember that although it is an honor to be Elected, it is also an honor to be Nominated!!! Thank you for your BSL Contributions!!! See our Nomination Requirements for more information.